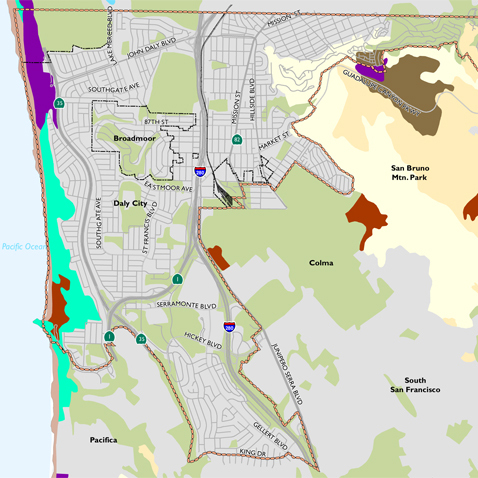 As the “Gateway to the Peninsula,” Daly City’s central location has helped foster a culturally diverse community that has become San Mateo County’s most populous city. The Daly City BART Station is a stop for all San Francisco/Peninsula trains and is served by SamTrans, Muni, and shuttle service, making the station a desirable origin and destination for commuting. Dyett & Bhatia prepared the EIR on the comprehensive General Plan Update (City staff developed the General Plan in-house). As part of this effort, D&B compiled a comprehensive environmental database for the city, developed and analyzed alternatives, and assessed impacts of the Draft General Plan, while outlining additional policies to the staff-prepared draft to minimize environmental impacts. The Draft EIR was prepared in six months from project start, including transportation and GHG modeling.